Who are you calling Twitters? It looks like an Express.co.uk story about the BBC and Twitter has been removed. Originally available at this link http://www.dailyexpress.co.uk/posts/view/152233/Is-the-BBC-run-by-a-bunch-of-Twitters-, it now shows as a missing story. The story, ‘Is the BBC run by a bunch of Twitters?’ can, however, still be found via the cache. 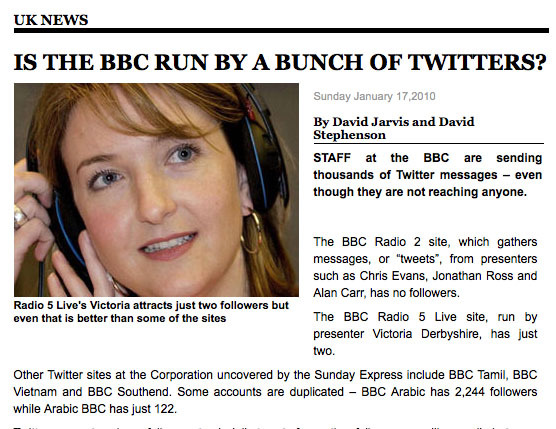 As Malcolm Coles noted on his blog yesterday, the Sunday Express claimed that some BBC Twitter accounts, such as Radio 5 Live’s Victoria Derbyshire, were being followed by only one or two people. But does the Express understand how Twitter works? Coles first suspected that the journalists muddled the account names, and now claims they’ve mixed up ‘follower’ and ‘following’ numbers. So Radio 5 Live’s @vicderbyshire actually has 3,692 followers but only follows 2 people (in fact, perhaps thanks to the story, her number of followers seems to be on the rise). Oops. Journalism.co.uk tried to clarify the situation with Express.co.uk. But it’s no comment for now, and we’re waiting a response from the legal department who deal with all enquiries about missing stories. This entry was posted in Online Journalism, Social media and blogging and tagged @vicderbyshire, BBC, malcolm coles, Twitter on January 18, 2010 by Judith Townend.